I can sum up this book by saying I wanted to like it more than I did. I mostly read historical mysteries, but having recently read and enjoyed two Agatha Christie novels, I thought it would be nice to broaden my horizons a bit. I read about this series on Amazon and readers rave about it. In fact, Amazon names Louise Penny’s most recent novel in the series as one of their Best Books of 2011. Granted, this is book one in the series, and Penny’s first novel. So I’m willing to cut it some slack and say the rest of the series is probably stronger. The Amazon reviews seem to bear that out. 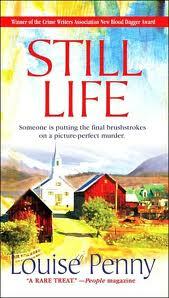 Still Life is a modern-day mystery series set in a small town near Montreal. The main character is Inspector Armand Gamache, who definitely reminded me of Hercule Poirot, although less all-knowing. Gamache is an experienced inspector who loves his wife, good coffee, and mentoring new recruits to the force. He is the Chief Inspector of the Surete du Quebec. Gamache is sent to Three Pines to investigate the death of Jane Neal, an elderly woman who is found dead in the forest near her house, killed by an arrow. Hunting accidents are common in this area, so Gamache must determine whether a murder has been committed in this sleepy small town. And if so, by whom. Jane has no apparent enemies, except for an estranged niece who stands to inherit Jane’s house and property. Jane is a woman everyone loves, except she has a few strange secrets. For one thing, she won’t let anyone see the inside of her house. And for another, she’s an avid painter but won’t let anyone see her work. Just days after her first painting is accepted for a public exhibit, she is found dead. Some things I enjoyed about this book: Penny highlights the tensions between French and English Canadians. Canada is a place I know nothing about, so it made for interesting reading. Many in this small town are English speakers, who feel their right to speak English is in jeopardy, and that they are discriminated against just for being English speakers. I found that an interesting contrast to current-day U.S. politics. I also enjoyed the teamwork approach to Gamache’s investigation. Most mysteries center around one super-human, all-knowing investigator who seems to be everywhere at once and remembers every detail. This book is written more like TV investigation shows, where a team of people set up a work room and each report back on their assignments. Even more interesting, this book features a character who is NOT an effective member of the team. Gamache must work with her to teach her good investigative techniques (which basically boils down to listening, questioning, observing, and being sensitive to people around you). I liked that the mechanics of investigation were part of the story. Ultimately, though, I didn’t love the story itself, nor the characters in this sleepy small town. One of the things that makes a mystery fun is learning that everyone is not what they appear on the surface. In this book, however, with the exception of the villain, everyone pretty much is what they appear on the surface. There are a few side secrets but for the most part, the characters are fairly one-dimensional. Penny’s writing could benefit from a lot more subtlety. One thing that drove me crazy, for example, was the characterization of Jane’s niece Yvonne, her husband, and her son. Bad enough that these characters were so over the top bad, but then Penny goes one step further and gives them the last name of “Malenfant” (in French, “bad child”). Every time I read it I cringed. I also didn’t like how much philosophizing there was about the “bad” people in town, from the “bad” investigator to the Malenfant family. Too much speech-making — it only made the oh-so-good characters annoying. While the story and its resolution was unsatisfying for me, I should note that I read this book during an incredibly stressful week and probably wouldn’t have enjoyed anything I read. I do believe this series will improve, and there was enough to like that I might read more. I’m just not sure this is a series that rises to the top of the reading list. Although this is by no means a bad book, I didn’t like it nearly as much as the other reviewers. To me, the writing was sometimes disjointed and did not flow smoothly, in particular in the conversation between characters and sometimes when jumping between the present and the past. For a first novel about a village and the police officers called there to investigate a suspicious death, there was too much detail to absorb about all the different characters. A good series peels the layers away gradually, allowing depth to be revealed over time. I thought this book tried to reveal too much, too soon. Inspector Gamache IS an appealing and intelligent character. All of the officers are supposed to be sharp in intellect. That made it strange (and annoying) to see how young officer Nichol misunderstood her superior’s advice. It was also mystifying how Gamache, who is so observant and understanding of human nature, could not see how his advice to Nichol had gone wrong. Finally, I just didn’t “buy” the villian of the book. There were enough other plausible suspects to make it interesting, but, in the end, I couldn’t believe that the killer could have kept his or her true nature hidden from so many intelligent people for so long. How could the other villagers have not seen something to make them know the nature of this callous individual over the many years they had lived together closely? In a big city where you nod hello to the other people in your apartment building, then I buy that you say “He seemed like such a nice guy.” I grew up in a small town, and I found it hard to believe that almost no one really knew the killer. I want to read a mystery that makes sense and that is internally consistent, but I felt this book fell a bit short in that regard.